It’s another gorgeous warm day in Niagara as I walk the grounds of The Good Earth Food and Wine Company in search of Dr. Dre to taste her lineup of summer releases from this now established Beamsville winery, bistro and cooking school. In the distance I can hear the thumping back beat of a band I don’t recognize. So, knowing winemaker Andréa Glass’s love of music, I simply follow the tunes. It leads to the winery, where the woman they playfully call Dr. Dre, a fifth-generation Niagaran, is plying her trade blissfully surrounded by fermented grape juice, tanks, oak barrels and loud music. Yes, the wines made at The Good Earth Wine Company are raised on a steady diet of eclectic music and maybe, just maybe, that’s what gives that delicious and honest portfolio its attitude. 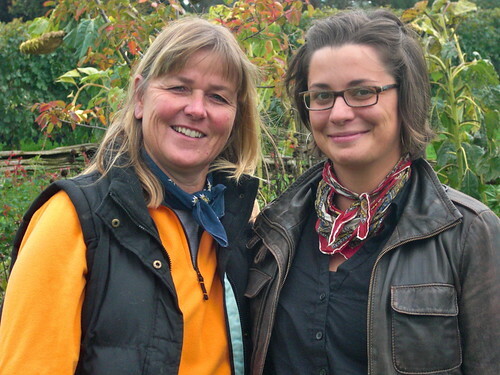 It’s a comfortable feel at The Good Earth, the food-wine-cooking emporium that Nicolette Novak has created on her childhood home and family farm in the Twenty Valley. 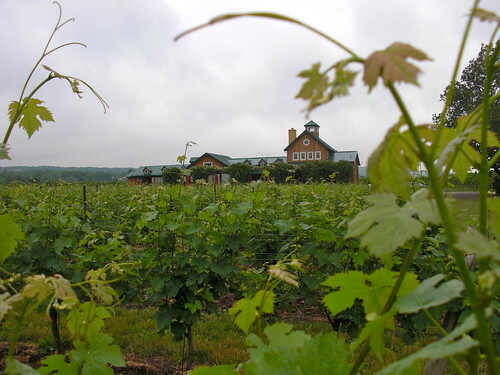 Novak, pictured with Glass at the right, has added to the orchards and cooking school she opened in 1998 with the addition of the winery and patio offering, providing good wines, good food and good times to wine lovers and foodies looking for an unpretentious, authentic experience. 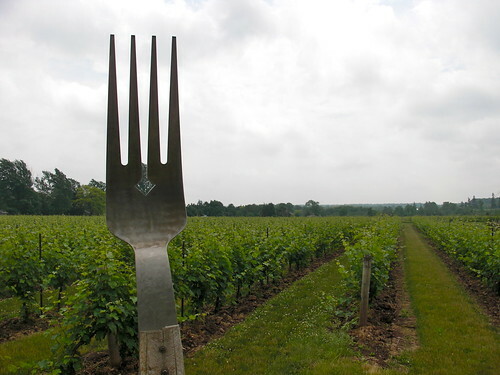 In a lot of ways, The Good Earth encompasses all the great things Niagara does best; wine and locally-produced food in a pastoral setting that harkens back to simpler times. It is charming and folksy at Good Earth and you get a sense of that sitting on the back patio with a view of the 15-acre vineyard sitting alongside its producing orchards and vegetable gardens. Nearby, an outdoor wood-fired oven is churning out flatbread pizzas made with seasonal ingredients as the always bubbly Christine Oriente lists the specials of the day, which, not surprisingly all include asparagus in one form or another. The patio is getting crowded as the inside bistro begins to fill up. I’ve got a perfect spot to taste through Glass’s new summer releases as a warm breeze takes the edge off another round of Niagara humidity. The Good Earth cut its teeth on a small production (only 2,500 cases to start) of Dry and Off-Dry Riesling, Cabernet Franc, Pinot Noir, Chardonnay and Rosé, reflecting the strengths of the growing conditions of its cool climate location. Here’s a look at the new releases now available at the Good Earth Wine Company. The Good Earth Betty’s Blend 2011 ($18, 87 points) — Glass says this blend of 50% Chardonnay and 25% each of Sauvignon Blanc and Riesling is a perfect tribute to Novak’s mom Betty, who is one stylish and elegant lady. “She’s just like Zsa Zsa Gabor,” Glass says. “I’d wear everything in her wardrobe.” The nose shows expressive apple, citrus and tropical fruits with a subtle floral note. In the mouth, there is good vibrancy but also some elegance and weight to go with peach, pear, citrus and apple fruit flavours. 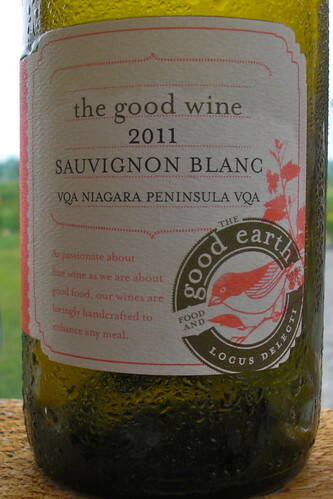 The Good Earth Sauvignon Blanc 2011 ($18, 89 points) — Glass played around with different yeasts and finished the wine, sourced from grapes grown in Niagara-on-the-Lake, in neutral oak barrels for just a touch of spice and a more elegant mouth-feel. The nose reveals gooseberry, tropical fruits and just a bit of grass and spice notes. It’s bold on the palate with zippy-racy citrus, grapefruit, tropical fruits and a lively note of fresh garden herbs and spice. Just a well balanced, layered and delicious first effort Sauvignon Blanc from Glass. Good Earth Rose 2011 ($18, 88 points) — I am always on the lookout for delicious rose for the hot months and this one fits the bill perfectly. It’s made from 100% Cabernet Franc and shows cherry, raspberry and cassis notes on the nose with just a touch of fresh herbs. It’s made in a dry style, much preferred on hot summer days, with good acid to balance out the ripe red fruits. Quite delicious. The Good Earth Cabernet Franc 2010 ($22, 89 points) — Glass takes a hands-off approach to most of her winemaking and in particular, this favourite variety of the winery. Only 92 cases were made of this third-harvest wine. 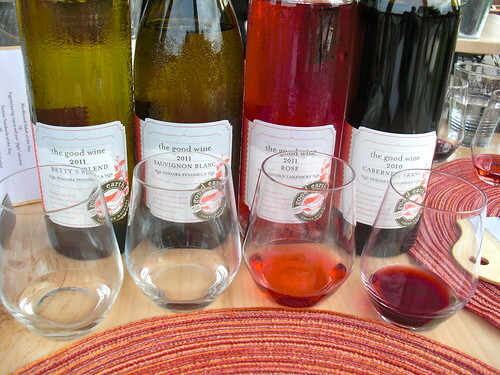 “The wine pretty much made itself,” says Glass. “I kept it clean, filtered it and bottled it. I didn’t want to get too carried away.” The estate fruit was picked at 23 brix, a little earlier than some wineries, but Glass wanted to maintain the acidity from a hot vintage. The nose shows purity of cherry fruit, almost kirsch-like, with strawberry and a touch of herbs. It’s quite balanced for the vintage with delicious red fruits on the palate to go with integrated herbs and soft spice notes. Not overdone at all. Just delicious. 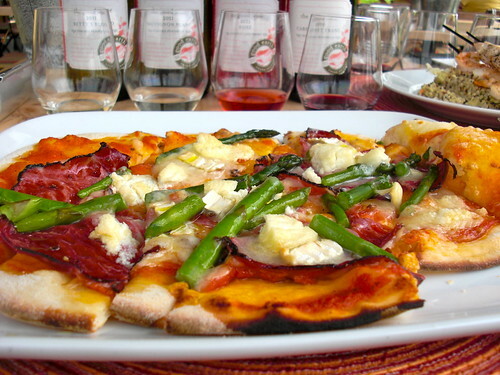 It paired beautifully with the Montreal smoked meat, goat geese and fresh asparagus flatbread pizza I ordered. 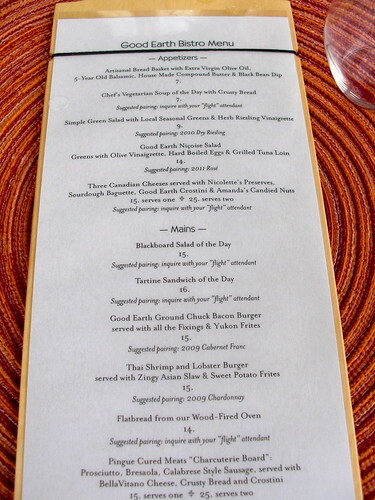 Both the pizza and full menu are pictured above. The Grape Chronicles, Part III: Flower power!